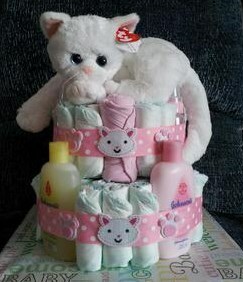 Kitty and Bear Diaper Cakes. These are two of the diaper cakes I've made recently: a kitty diaper cake for a baby girl and a neutral Teddy Bear diaper cake. 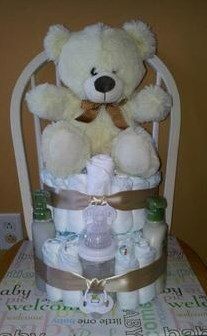 I like the base Tiffany uses for her diaper cakes. Seems it's just a piece of cardboard wrapped in some cute baby wrapping paper. Cute idea and her cakes are really cute and creative, too!